Children’s brains grow at a higher rate throughout the first 18 to 24 years of life than they do as adults. Within this extended time period, there are two periods of even more rapid brain growth; birth to 4 – 6 years and for 4 – 6 years during puberty. 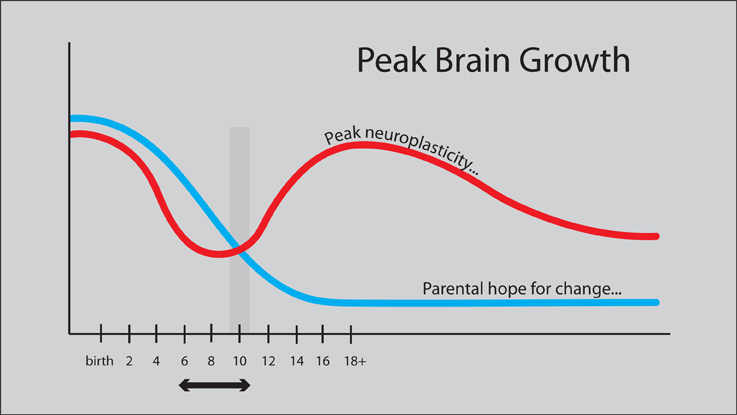 The two periods of most rapid brain growth are marked in red on the diagram. In my experience, parental hope for recovery follows a different curve starting high and maintaining over the first 4 to 6 years. In the early high growth period, there is a terrific match of goals and possibility. The parents have the goal of complete recovery and are highly motivated to do anything that may help their baby. The baby’s brain (or nerve) is in the process of recovery and is capable of responding with exuberant neuroplasticity. The 4 to 6 years of pubertal brain growth are equally important. Unfortunately, during puberty, there often is a mismatch between the parents hope for change and this neuroplastic opportunity. By the time the teenager’s brain is going into the active growth and development period of puberty, the parents’ belief in the possibility of change has been lowered. It is hard for anyone to maintain enthusiasm and motivation in the face of failure to reach a goal. Parents who worked hard to help their child to walk normally start to realize, at about 6 to 8 years, that the child’s gait is still abnormal. Often, at about this age, surgery is recommended to correct biomechanical distortions. They have to wonder if this approach will work any better than what they have already tried, because by this age, most parents have learned to have a certain amount of cynicism about people who promise great gains. Their motivation and hope for change have been slowly chipped away. To compound the problem, many professionals have encouraged them to “accept reality” and get on with life. Here are some good news and bad news facts. The pubertal brain growth spurt will give the child about 40% more brainpower, but in the process it also turns them temporarily into alien beings who start arguing with their parents and standing up for their choices. This is the time when young people often decide that they are not going to wear braces, they are not going to do therapy, and most importantly, they will not consider surgical correction of the bodily distortions that they have. If we look at this situation from their viewpoint, they have gone to therapy all their life and it did not achieve their goals. Why should they agree to do more? It’s not surprising that parents start to consider the child’s wishes more and gradually, whatever therapeutic regime was underway gets further chipped and eaten away. In my view, this is a tragedy. Puberty offers a second chance for major change. A child in puberty is like a peak performance athlete on illegal drugs. They are growing rapidly because they have excess amounts of growth hormones, anabolic steroids, and hormones that initiate sexual development. As their prefrontal cortex matures, they are capable of motivated, focused work in therapy. In my own experience, any teenager who goes into intensive, motivated practice in puberty will improve, usually by one or two levels of function. It is a golden opportunity that is almost universally wasted. I was recently at a parents’ meeting and was asked by several parents what to do about therapy when the teenager does not want to do it. My answer is, be a parent. Your job is to motivate your child into a positive mindset. If you are having trouble, seek help. I think what drives me the craziest about all of this is that somehow, treatment for progressive neurologic and biomechanical distortions is treated as if it is optional. What if your teenager was diagnosed with a serious, chronic medical problem such as early onset diabetes (type I)? These children need insulin and have to have it daily. They need blood tests and they have multiple tests every day, 7 days a week. They need to do a regular exercise routine and if they don’t, their blood sugar goes out of control. Parents have to be vigilant about what they are eating every day, every week, every month for life. Possibly the difference is that if you have this type of medical condition, noncompliance with the therapeutic regime often gives you an instantaneous feedback. In non-compliant teenagers with an early neurological injury, the bad effects are also visible, but they occur slowly and we all adapt and accept the changes as inevitable. Here is the harsh reality. With our current methods of treatment, the majority of children diagnosed with cerebral palsy are going to have permanent biomechanical distortions in adulthood. Experts in Brachial Plexus Injury treatment teach that there is an expected progressive biomechanical distortion with growth. Long-term follow-up studies of adults who had an early neurological injury indicate that the issue that most interferes with their quality of life is chronic musculoskeletal pain. The data is in. It is evidence-based. Yet treatment, both to prevent distortions in the early stages and correct distortions in the later stages of childhood and adolescence are still considered optional by many. This is just bad medicine. The teenager with diabetes is not allowed to go off his treatment regime. The teenager with asthma does not get to choose to stop using his inhaler. I could go on and on and on. Preventing distortion and maintaining alignment are absolute necessities for any child with cerebral palsy. Next week I will write about intensives for teens. Not only do they work wonderfully well, but if you do it right, you can build motivation quickly. Under Browse by topic: Alignment and Cerebral Palsy Spasticity Series blogs. 1. Waters PM. Obstetric Brachial Plexus Injuries: Evaluation and Management. J Am Acad Orthop Surg. 1997 Jul;5(4):205-214. 2. Andersson C, Mattsson E. Adults with cerebral palsy: a survey describing problems, needs, and resources, with special emphasis on locomotion. Dev Med Child Neurol. 2001 Feb; 43(2): 76-82. 3. Schwartz L, Engel JM, Jensen MP. Pain in persons with cerebral palsy. Arch Phys Med Rehabil. 1999 Oct;80(10):1243-1246. 4. Jahnsen R, Villien L, Aamodt G, Stanghelle JK, Holm I. Musculoskeletal pain in adults with cerebral palsy compared with the general population. J Rehabil Med. 2004 Mar;36(2):78-84.
i´ve just jump into your blog and i ´m reading your comments , these are all thoughts going around in my mind for the last two years. My son is 16 years old, he´s diagnose with cerebral palsy, we´ve been at the Institutes for the achievement of human potential (Philadelphia Geln Doman´s) for many years, then we´ve been to ABR in Montreal and now we are just doing a bit of ABR learned in all those years.